He was a speculated candidate to represent his home state of Kansas in the United States Senate in 2020. Pompeo ultimately declined to run in 2020, but implied an openness to seeking statewide office in the future. Pompeo was born in Orange, California, the son of Dorothy (née Mercer) and Wayne Pompeo. His father was of Italian ancestry; his paternal great-grandparents were born in Caramanico Terme, Abruzzo, and emigrated to to the United States in 1907. Pompeo was active in the Boy Scouts, earning the rank of Eagle Scout. In 1982, Pompeo graduated from Los Amigos High School in Fountain Valley, California, where he played power forward on the basketball team. 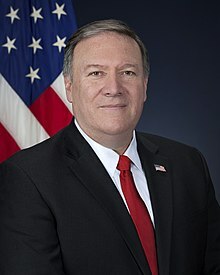 In 1986, Pompeo graduated first in his class from the United States Military Academy at West Point, where he majored in engineering management. On October 10, 2018, Pompeo said that Israel "is everything we want the entire Middle East to look like going forward" and that the Israel–United States relations are "stronger than ever". In March 2019, when questioned regarding Isreal's conflicts with Iran and following a visit to the Western Wall with Israeli Prime Minister Benjamin Netanyahu, Pompeo spoke to "the work that our administration's done to make sure that this democracy in the Middle East, that this Jewish state, remains...I am confident that the Lord is at work here." ^ Burke, Michael. "Pompeo open to future Senate run: 'The Lord will get me to the right place'". The Hill. Retrieved March 31, 2019. Wikimedia Commons has media related to Mike Pompeo. This page was last edited on 20 April 2019, at 05:00 (UTC).